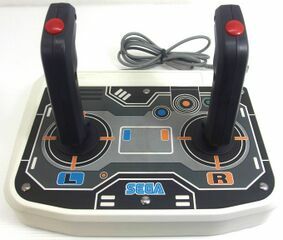 The Saturn Twin Stick (ツインスティック) is a special peripheral designed with Cyber Troopers Virtual-On in mind. As the name suggests it features two joysticks at the expense of fewer buttons. Despite having a product code of its own (HSS-0151), it was only ever sold as part of a HSS-0154 pack containing Cyber Troopers Virtual-On. The Saturn Twin Stick was only released in Japan (despite having detailed descriptions of the controls in the US and EU Cyber Troopers Virtual-On manualMedia:Virtualon sat us manual.pdf), and its design would go on to inspire the Dreamcast Twin Stick.